1. How is big data changing your campus recruiting strategy? 2. Do your recruiting events capture and process data to improve ROI? 3.6.2 What browsers does it work on? 3.6.3 Does it have an app and mobile functionality? 3.6.5 Does it come with a request-to-recruit approval workflow? 3.6.6 Will it link to your career site and internal hiring board? 3.6.7 Is there an onboarding option? 3.6.8 Does the provider offer ongoing support? 3.7.1 What are some features of Rakuna Recruit App? 3.7.2 How Rakuna Recruit Dashboard benefits your college recruiting strategy? How is big data changing your campus recruiting strategy? Big data is revolutionizing how we do business and analyze data. It is a major theme in nearly every industry now, and campus recruiting leaders who know how to harness the limitless possibilities from big data can take out the guesswork, work out evidence-based strategy for their campus recruiting programs, and sell their team’s contributions to their overall organizations. Data can be categorized into two types: one that can be purchased as part of the initial market research for strategy setting and one that must be collected, built, and managed over time for the purposes of evaluation and reporting. If you just started your campus recruiting program, or want to take a panoramic view of the market to form a national strategy, you can think of third-party data providers like NACE for school selection, market analysis, diversity strategy, etc. NACE has a large amount of data around majors related to your organization, degree level of your target, diversity information, and sponsorship. Apart from third-party providers, you have free database like IPEDS database published by the U.S. Department of Education’s National Center for Education Statistics at your disposal. External consultants can be another option if you need further customized data-gathering reports. In terms of collecting data for college recruiting, the most important thing is to gather the appropriate data from on-campus recruitment activities. As high-touch techniques including offline campus activities like career/job fairs and on-campus info sessions continue to be the most commonly used and most effective branding techniques, companies need the right campus recruiting software to help with capturing structured data from these activities to improve ROI. Do your recruiting events capture and process data to improve ROI? Pre-event registration systems do a pretty great job of capturing structured data regarding prospective candidates, but once the event starts, a shroud of mystery descends on the event venue and staff. Are you talking to enough targeted students? Are they getting a positive experience from talking to your staff? How is the quality of the candidates at the event? What event, or what school should you send your staff to? Data would help you answer the question “Why?” Why are we going to this school instead of that school? Why are we attending this event instead of that event? Why are we sending this person instead of that person to represent us? Now, let’s move beyond the “requirement of two-years’ experience” for entry-level job ads and talk about how to actually insert valuable numbers into your campus recruiting program. As we prepare for summer recruiting, there would be various activities in the recruitment space: LinkedIn continues to try to onboard more university students with the launch of its new app, The Muse continues to grow its content empire, and the digital footprint of millennial talent is creating more informed hiring decisions whichever way you slice it. Campus recruiting teams must always be pushing to become more data informed. Couple this with the ground level work of your on-site campus recruiters, and you can have a hiring machine! The collection and analysis of online and in-person data make for less biased hiring decisions. As we enter one of the high seasons of campus recruiting, let’s talk about some actionable steps to insert data into your campus recruiting program. Reach an agreement on required information and key questions to ask each candidate, and make sure that all candidates have that necessary information kept in your file. It sounds simple, but it’s essential. All of the organization’s onsite representatives at meetups and career fairs have to collect “on the go” information with uniformity. This will create your baseline of candidate information. While university talent is less proven, this will move the comparison of apples and oranges to - at the very least - granny apples to gala apples, so to speak. How to make your campus recruiting program more data-driven: Determine which two or three questions are necessary that all candidates from a college need to answer for your business in general and your departments in particular. Machine learning will improve. So of course, you would want a database structure set up to grow. Let’s start simpler. What do you prioritize in your hiring efforts? Consider mapping the skills and traits you value to a scoring system that helps to avoid making decisions based on your gut feeling or emotion. But gut still matters and can be part of the scoring system; for example, you can rate candidates based on their soft skills. This will be highly beneficial to your candidate evaluation and selection. How to make your campus recruiting program more data-driven: List out the top five hard and soft skills that your company values in your pool of candidates. Then organize meetings with those who are in charge to come to an agreement on those required skills. New candidates, new hires, and brand awareness are brought in through hiring events. Without measuring ROI per school, per event type, and per recruiter, you cannot optimize your year-over-year recruitment budget spending. Recruiters need to put all the data in a place and should categorize those data into different classifications regarding university, individual employer performance, or by event type. And then next year, choosing which events to attend or not, and invest more in data-driven decisions. 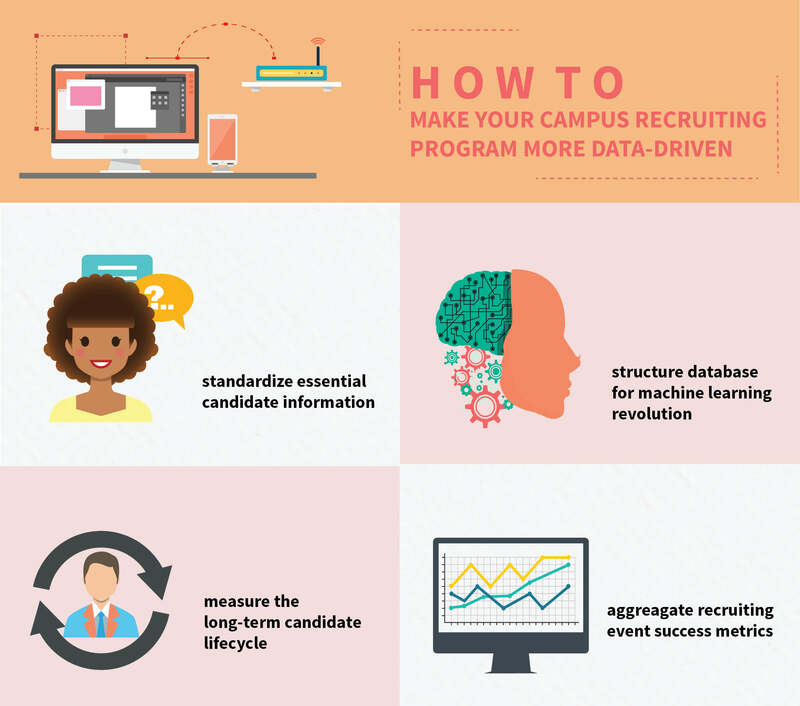 How to make your campus recruiting program more data-driven: With each event you are going to take part in, you need to determine the cost for each candidate and each hire. Businesses should focus on nurturing their relationships with candidates before they are really hired. When building a talent pool of potential candidates, the life-cycle of the candidate should really be taken into account. If you effectively remain a top-of-mind employment option, you’ll have a competitive advantage over many other companies vying for their attention when it’s time for the students to enter the workforce. Assess the interaction actions of the candidate pool, including their potential growth as your company’s employees, their email open rate, the percentage of them becoming your employees, etc. How to make your campus recruiting more data driven: Decide on the key touch points with all long-term candidates, whether you send them standardized or personalized emails/messages. It is about making you the top-of-mind recruiter. Potential university recruits are some of the most unproven workers. But it does not mean that recruiters can make any less objective recruiting decisions. Utilizing a data-driven campus recruiting program following a decent order will be highly advantageous to you and your organization. Time-consumption, and headaches can hardly be avoided in course of campus recruiting events. Recruiters often find themselves grappling with an enormous of information to decide on their key messages, the number of candidates needed and so on. Campus recruiting software can get rid of these barriers and allow recruiter to manage events and material, standardize staff’s interactions and facilitate on-site attendee management and follow-up, all in one place! HR teams can access to a central space where they can easily communicate with team members to implement plans, integrate and analyze data of candidates and job applications status to make necessary next steps in the campus recruiting event. It’s time to leave behind manual handling of paper resumes and candidate data on spreadsheets and make an investment in campus recruiting software. Remember to take mobile-friendly campus recruiting software into consideration as it allows candidates to upload their resumes on the spot at on-campus recruiting event. Your staff can easily get access to paper resumes and candidate information for evaluation at ease on a phone or tablet Goodbye to long hours in front of a computer or struggling with piles after piles of paper. Manage vent materials, historical event venue information and on-site event personnel information with a single event hub so that every HR team member can gain access to a complete system. Utilize the streamlined system to delegate staff tasks, drive attendance and coordinate post-event follow-up with candidates. Young people are prone to using their mobile devices to apply for jobs and keep track of their application progress. According to a report from Kelton Global, 80% of job seekers prefer to look for jobs on their phones, whereas 54% said that they have utilized a mobile device to seek for a job. Furthermore, according to Indeed Hiring Lab, 73.4% of millennials click on jobs from their mobile devices. Potential college graduates can be reached by utilizing mobile-friendly campus recruiting software. With campus recruiting software, it is easier to provide millennials and younger generations attending campus recruiting events a superb experience as they take their mobile devices to and use them throughout the job search and application journey. According to LinkedIn Talent Solutions, 72% of active candidates view a business’ career website when searching for jobs. When candidates log onto your website, 94% of them expect to see current job vacancies, 72% look for a description of the company’s culture, 61% are curious about company history, 56% want to have benefits information and 45% check the company’s employee profiles. A campus recruiting software will lend a helping hand to companies in establishing branded websites for each college they visit or event they organize. Potential candidates can log onto the website, see personalized messages about their school or event and commence their application journey right off the bat! Impress students with the latest technology that allow you to create, track and streamline candidate application journey. Deploy a central event repository to store everything you need to know about a specific campus to gain valuable insights into trends and improve campus-based recruiting ROI. Event ROI report is one of the ultimate goals for almost every campus recruiter when attending campus recruitment event. 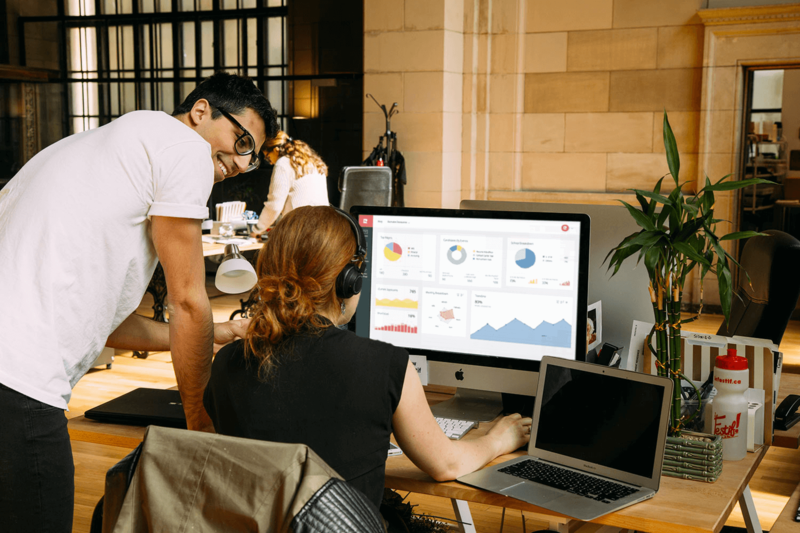 With metrics reporting tools, which is often an indispensable tool in campus recruiting software, can help your HR teams to quickly obtain event data transparency and effectively measure ROI associated with each event. With comprehensive data, you can have broader and deeper view at where your recruitment marketing efforts are paying off in order to accurately determine how to allocate your resources. Make your presence at hiring events more cost-effective by pinpointing which campus and conferences can produce in the highest ROI. On-campus career fair procedure may vary from campus to campus. Implement a clever campus recruiting strategy by establishing replicable processes for your team. A formalized campus recruitment program will improve candidates’ experience with your company by the unmatched consistency and smooth event management aided by campus recruiting software. Be relieved at the elimination of disorder and provide all stakeholders with a clear understanding of event expectations. 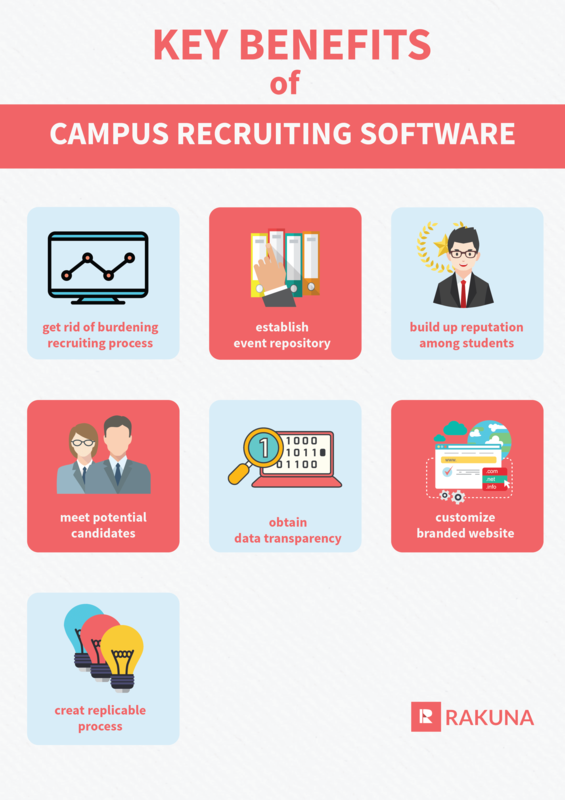 Choosing the right campus recruitment software for your company can be really daunting. With these tips, we will show you what you and your company truly need and how you can find it in your campus recruitment software. If the recruitment software you are considering brands itself as an Applicant Tracking System (ATS) - that is a major red flag. You should really take into account whether they’re worth spending time. It should be cloud-based recruitment software. It should be easy to set up and use without having to call up a support agent. It should offer a free-plan as the entry point. Don’t confuse a free-plan with a free-trial. It should be built with APIs to help integrate with other current software into your HRMS system. It should be highly customizable. Every brand and organization is different. You need to be able to design your job ads, but also tailor the backend to your requirements. You should also be able to adjust your application templates, and search filters. To focus on the first point: most modern recruitment software uses cloud-based software, and this is definitely the way to go over the old server or web-based software. Where it’s hosted, you want your data hosted in accordance to your company location(s) and jurisdictions. Data Privacy. Make sure they provide full data privacy for your company and its needs. Data Ownership rights. Write it down so that the supplier can have a backup file of your data and provide it to you if you choose to move to another recruitment software. Service Availability. What are the uptime and service like? Don’t be afraid to ask for a customer reference to see if it has experienced any downtime. Consider your HR team. Some might use the Chrome browser to access the recruitment software on their desktop but use Safari on their iPads. So make sure to ask the supplier if the software works on all the browsers that your team works on. Try out a free trial or free plan if you can - as some are optimized for certain browsers and won’t work as smoothly on others. Does it have an app and mobile functionality? With the rise of workplace flexibility and the demand for top talent, recruiting needs to be done quickly and easily from anywhere. This is why having the recruitment software accessible to everyone in your HR team is so important. How do you determine accessibility? For starters, make sure your recruitment platform has an app that is designed for all mobile devices and tablets. it’s also important to make sure the app is not limited. It should allow you to view current jobs, candidate resumes, review applications, submit job requisitions, communicate with candidates and schedule interviews. Does it come with a request-to-recruit approval workflow? A recruitment platform that’s equipped with a request-to-recruit module is highly beneficial to corporate clients. Gone are the days where you had to chase executives and hiring managers for approval signatures, and then type the information into the system to start hiring. Will it link to your career site and internal hiring board? Since a career site plays an important role in promoting the company’s brand, you should create software which links to your career site. You can even get a software that offers an out-of-the-box career site if you have not already had one. Is there an onboarding option? Unless you already have an onboarding module that works best for you, and one that can integrate with the recruitment software you are about to purchase, you should try to find a recruitment software that comes with an onboarding module. Onboarding products have come a long way over the last few years and have matured a fair bit. And make sure that the onboarding module has automation to auto-generate the contracts and forms, a notification system, and a digital signing technology. Does the provider offer ongoing support? Support at every stage is very important. You need to know and understand the support hours, language, service level and price of what you are getting. Be aware of the hidden costs of support that some suppliers charge you. Get The Ultimate Master List of US Career Fairs Fall 2018 - Spring 2019 (July Updated) NOW!